This recipe comes from a fun, simple cookbook that we got as a wedding present…Charleston Receipts Repeats, which is put together by the Junior League of Charleston, SC. I’m fairly certain that my parents have this cookbook, and maybe you do, too! It’s a good one. We especially love seeing which southern lady contributed – for instance, this is Mrs. Robert Oliver Maguire (Lucie Hall)’s recipe. Thanks, Mrs. Maguire! Sift together flour, baking powder, and salt. Add the shortening. Work it in well with a pastry blender/cutter (we don’t have one of these, so we used our potato masher). Add the milk slowly. Work it in with a spoon until slightly sticky. Place on ungreased cookie sheet about 1/4 inch apart. Bake 12-15 minutes at 450 degrees. 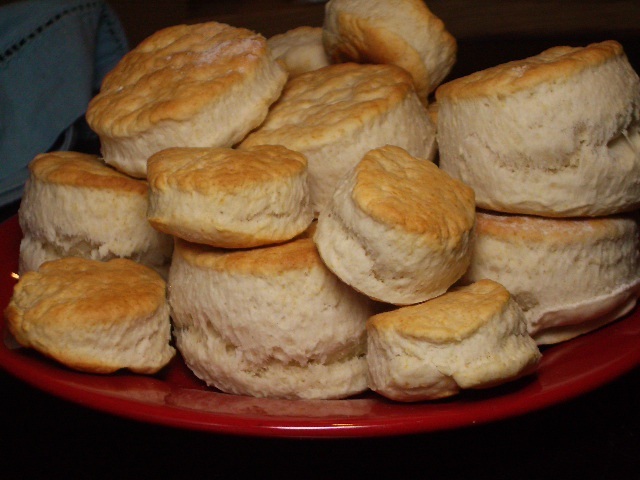 By the way, Mrs. Maguire says this will make 30 biscuits. YEAH, right. 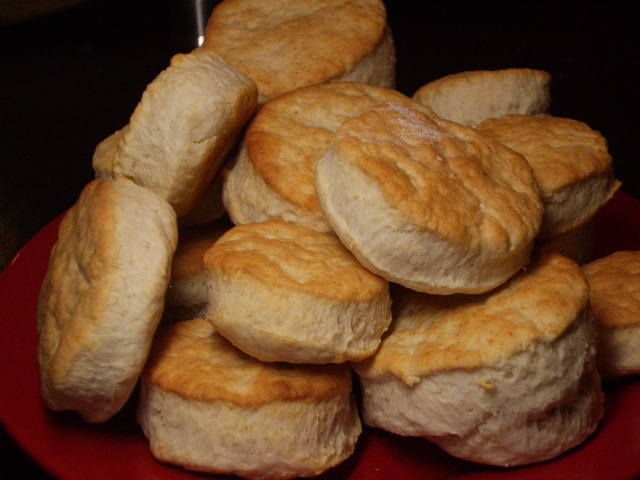 And thank goodness…because there’s just two of us, and that’s a lot of biscuits. This made about 8 big biscuits and 10 little biscuits for us… YUM. Serve them with whatever you like. We thought, for the sake of the blog, obviously, that we ought to try these biscuits every way possible. With special honey, apple butter, normal butter, orange marmalade, strawberry jam, under fried eggs, with bacon and cheese….we’re PIGS. but they’re goooood. Sure will, that’s her comment about mine:) It’s neat what ya’ll are doing! Love the watermelon on the summer plates! Wow! What a great connection- thanks for leaving a comment. Please give our best to Mrs. Maguire and thank her for the delicious recipe! I make them very small. But at any size they are all gone when the meal is over. Thanks for the complement. That’s my mom:) Noone makes them better than her either! She still makes them every year. I do have that cookbook! And, I never get as many biscuits as what the recipes say.